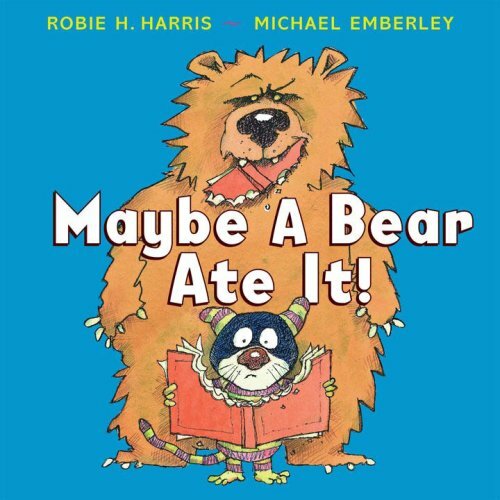 This week we’ve been reading Maybe a Bear Ate It! by Robie Harris with my little ones. (K & 1st). It is such a fun book, told just as much through the pictures as the minimal text. A little purple and green monster is reading HIS BOOK in bed. Then it disappears. He can’t live without it, and starts imagining all sorts of ridiculous things that might’ve happened to it. . .
“How many of you have found something you thought you lost under your bed? (Lots of sharing time here. . .the best one was a little boy who found his puppy under his bed). It’s definitely on my most recommended list, especially for librarians. . it’s a good lead-in to a book care lesson without feeling too didactic. 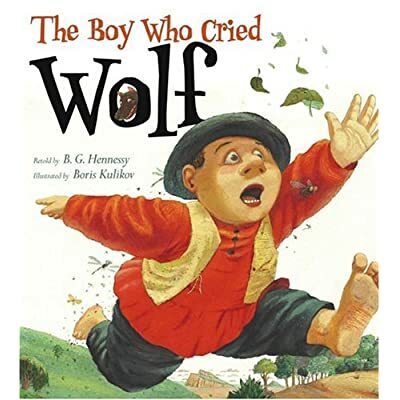 I read The Boy Who Cried Wolf by B.G. Hennessy to one of my classes today, since they’re studying fairy tales and fables in reading this week. Before reading we talked about how a fable is a story that’s meant to teach a lesson, and I asked them to be thinking about what lesson this story was teaching while they listened. Side note–I love this version of the story! It has captivating illustrations (down to the lazy shepherd boy lying on the grass picking his nose!) and fun text to read aloud. Check it out on amazon.